This nautical-themed key chain is both adorable and functional, featuring a chrome telescope key fob. 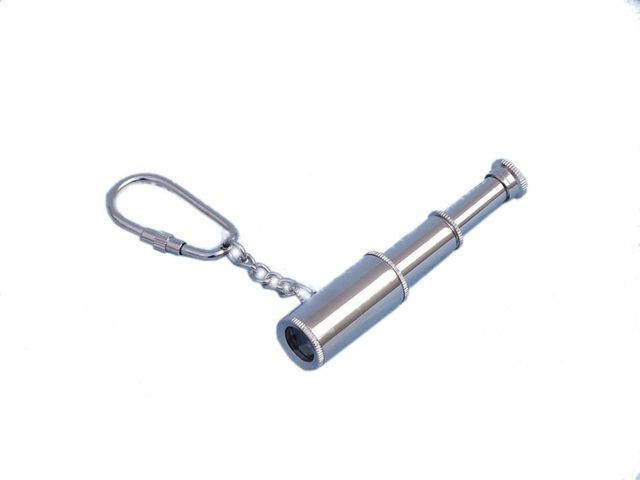 Crafted from chrome, this spyglass key chain is as beautiful as it is durable and functional. A knurled knob allows you to easily and securely add or remove keys from the ring. These wonderful key chains make ideal gifts for friends, family, employees, clients, co-workers, and especially yourself. Though the basic concept for the telescope had come about prior to 1608, this is the year the first patent for this tool was applied for. Beginning a revolution in astronomic and military practices, becoming a common tool aboard naval and private ships, the classic nautical telescope has been faithfully reproduced on these solid brass key rings. The first telescopes used concave eyepieces along with an objective lens, made from quartz crystal, which produced a magnified but blurred image. In 1611 Johannes Kepler invented his own telescope using a convex eyepiece that drastically improved on the focusing power, yet inverted the image. As quality and design improved the telescope, like the ones on these brass keychains, it became a much more useful device. By 1668 reflective lenses were being used by Isaac Newton, and in 1733 the achromatic refracting lens was created. Using two lenses, one concave and one convex placed back to back, the achromatic lens pushed telescope design ever farther. Up until this point creating telescopes was a large ordeal, though by the late18th century, using the most modern technology, it became possible to manufacture them on a larger scale. Replicated on these brass keychains is an early modern telescope, with a design that became common among sea farers, naval and pirate alike. The original nautical telescopes were crafted from leather and wood, often with brass fittings, and as quality metal production increased later came to be produced in solid brass. The telescope on this brass key ring is something that these 18th century sailors would have used to spot approaching ships, enemy targets, and obstacles in the high seas. Each of these brass keychains depicts a significant part of history; a tool that literally and figuratively changed the way we see the world.